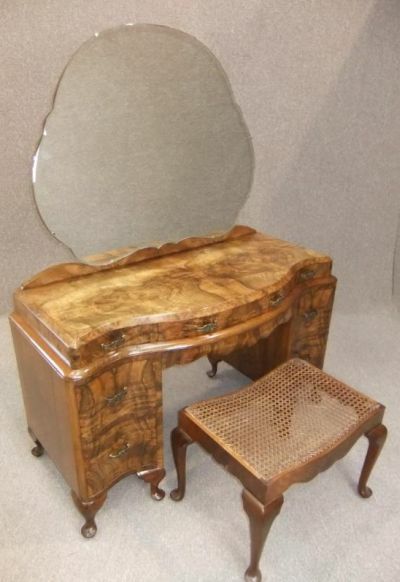 A superb quality and highly desirable burr walnut Art Deco dressing table; featuring a large cloud shaped mirror to top. This dressing table has two banks of serpentine fronted drawers; all fitted with the original brass handles, and stands upon small Queen Anne style legs. This art deco dressing table is in beautiful condition for its age, as it has been recently re-polished to highlight the beautiful quarter cut burr walnut veneer. This stunning dressing table is ideal to match up with existing furniture, or as a stand-alone piece in any period bedroom setting. Please note that the seat of the stool is quite weak, and so may need to be re-upholstered before use. If you like our Art Deco dressing table, you will love our full range of antique furniture. Click here to view.